With only two versions of Windows 8 to be available to consumers, plus one for ARM devices (pre-installed only), what you get ought to be straightforward. But, as is usual with a new version of Windows, there's still room for confusion because what you get with each version overlaps slightly. Windows 8 (yes, just Windows 8) is the home version for x86 Intel and AMD PCs. The features you do and don't get mostly make sense; joining a domain, encrypting your disk with BitLocker and being able to log into your PC remotely are business features. You can connect to a PC at work from a Windows 8 system, with Remote Desktop or a VPN, you can combine multiple hard drives into one storage 'pool' that has multiple copies of your files and you can mount VHD and ISO images as if they were hard drives – but you can't boot from a VHD file. What doesn't immediately make as much sense is that Media Center not included with Windows 8; it's "an economical media pack add-on" that's only available for Windows 8 Pro, which is otherwise for business users (or enthusiast users). Again, Windows 8 Pro is for for x86 Intel and AMD PCs. Microsoft has to pay licences for the codecs used in Media Centre, including Dolby technology. When the Developer Preview came out last September, Sinofsky commented that "the feedback about Media Center was predominantly "we will pay extra, just include it" based on the input directly to me," so it looks like Microsoft is taking users at their word. All three versions of Windows 8 run Metro-style (also now known as Microsoft design style) applications written in WinRT, the new Windows RunTime programming framework, which is also what Windows RT is named for. Windows RT will come pre-installed on ARM devices like Microsoft Surface, you won't be able to install it yourself. This is what was previously called Windows on ARM. It has both the Microsoft design style Start screen and the Windows desktop, with Task Manager and Explorer and support for multiple monitors (remember Windows RT devices won't be just tablets and they'll have connectors like HDMI). But even though you get the desktop on Windows RT, you can't install desktop applications. It comes with ARM-specific versions of Office apps – but just Word, Excel, PowerPoint and OneNote, so if you want Outlook you need a PC with an Intel or AMD processor. 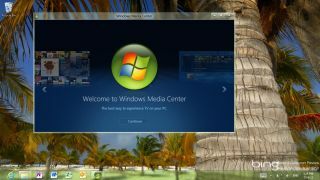 Windows RT doesn't include Media Center, or Windows Media Player; it will have updated version of the Music and Video apps we've seen for the Consumer Preview. But it will have the Play To feature that's only been in Media Player so far; this is now something any software can use to send the music or video you're playing to a DLNA-connected device like a smart TV, Xbox or Sonos music player and we expect to see that show up in the Metro Music and Video apps. It doesn't have BitLocker, but it does have its own form of device encryption, which is based on a Trusted Platform Module like BitLocker. That's not the same hardware TPM you find in Intel PCs today, it's part of the firmware in the system, but that's the same way that System on Chip x86 PCs running Windows 8 will implement the TPM, to keep power and hardware costs down. The main difference between device encryption and BitLocker seems to be that BitLocker can be managed by an IT administrator in a business using group policies and a domain; with no group policies or domain support that won't work on Windows RT. If you can manage device encryption it will be through Exchange Active Sync – the way you sync email and calendar appointments – which can already make you use a strong password on a smartphone or a Windows 8 PC. Running desktop apps on a tablet would be a bad idea. Although there will be Ultrabook-style thin notebooks running Windows RT rather than just tablets, tablets with just a touch screen aren't the best way to use the tiny icons and toolbars of the average Windows program. Even if you could run x86 instructions virtually on an ARM processor they'd be slow, and with all the background services and startup apps and power-hogging tools built into Windows app, they'd run down your battery. But if you want a thin, light, low power Windows 8 tablet that does run desktop applications, that's still on the cards using low-power System on Chip (SoC) processors from Intel and AMD. Like ARM-based Windows RT devices, Windows 8 PCs with x86 chips can give also you Connected Standby (where your PC turns off when you turn off the screen but leaves the Wi-Fi or mobile broadband running and receiving only the notifications you've asked for, so your Metro-style email stays up to date and you can get VoIP calls, but apps aren't running and neither is Windows). Connected Standby needs specific hardware that's not available yet, including Wi-Fi and mobile broadband hardware that can stay awake while the system is asleep, and a new level of ACPI power settings as well a new version of the NDIS network interface standard. And while any Windows 8 or Windows 8 Pro PC can have Connected Standby according to Microsoft's feature list, it's only going to be low-power SoCs that can meet the requirement for only using 5% of battery if you leave them on Connected Standby for 16 hours overnight. If you want the best of both Windows 8 and Windows RT, SoC PCs will give you that. But running Windows apps also means they need antivirus software and they'll come with all the crapware OEMs like to 'enhance' their PCs with; Windows RT tablets might come with extra Metro apps form OEMs but they'll be easy to remove and they can't run in the background. When you come to pick a Windows 8 PC, you'll have to weight up compatibility versus losing some of the deadweight of the Windows environment. That's what the different versions of Windows 8 are really about.